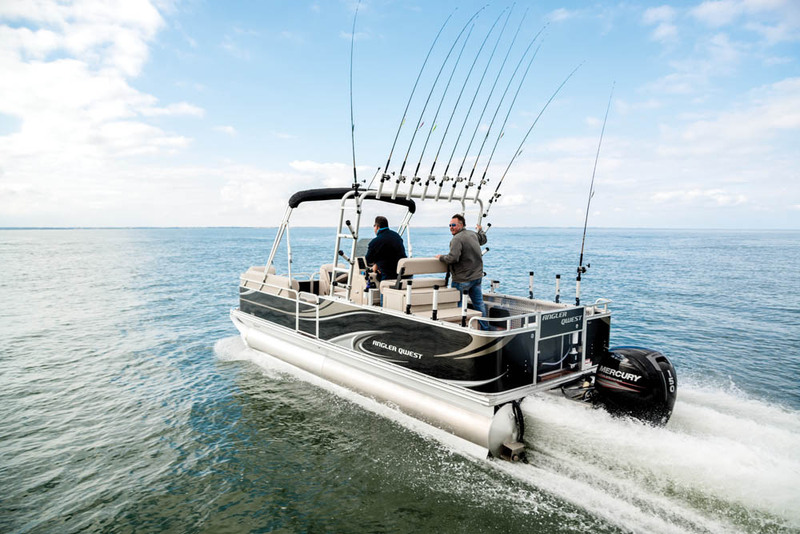 The Angler Qwest 822 Pro Troll takes the pontoon-as-fishing-platform concept to the max. After getting a tease of a first look at the Angler Qwest during the Miami Boat Show — it had nary a fishing rod on board — I got a chance to use it in its true element. I fished aboard one with Brad Dupuie who, during the week, Clark Kents it as the head of Apex Marine’s engineering and production department. But on the weekend he becomes Super(walleye)man in quest of his favorite quarry. Some people in the marine industry like boating and fishing well enough, but Dupuie lives and breathes it as he plies the waters of Michigan’s Saginaw Bay, a body of water that can get ugly quickly. The jaw-dropping, never-seen-before-on-a-pontoon-boat signature feature that puts the Pro in the 822 Pro Troll is the aluminum Traxstech arch. It includes eight rocket launcher rod holders on top and six adjustable holders on the side on accessory tracks, and there’s an option to add even more holders. With rods in place, it bristled like an alarmed porcupine as we prepared to shove off from Linwood Beach Marina. The other obvious unique feature is its center console design. 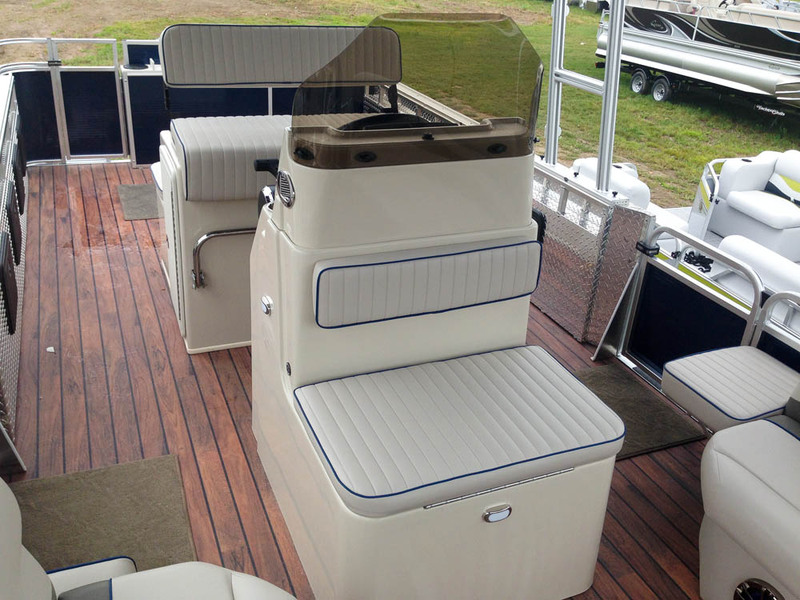 Unlike 22-foot center consoles of the fiberglass persuasion, however, this one has abundant room in the fishing cockpit and up front in the lounge section. Another striking feature of the 822 Pro Troll is the polished stainless steel diamond plating that corrals the inner sidewalls of the fishing arena. The plating gives the cockpit a great industrial look, protects the aluminum fencing and creates double walls that provide room in between for storage. 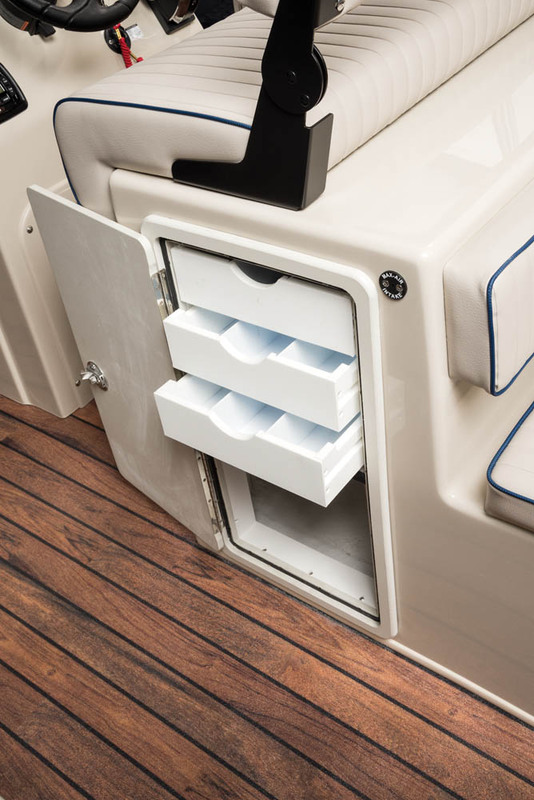 Three flip-down access hatches on each side deliver easy access. On top of the gunwales are two standard 72-inch Traxstech accessory tracks that allow owners to mount a vast array of hardware, such as more rod holders, downriggers, tool holders, cupholders and even a gas grill. Our triple-tube Pro Troll featured Mercury’s new-generation FourStroke 150, an in-line four-cylinder outboard designed to have as few parts as possible. It has a single overhead cam and two-valves per cylinder, which allows it to be the lightest four-stroke 150 on the market, tipping the scales at 455 pounds. While it might seem low-tech, items such as its rocker arms are used by Formula One cars. It has 3.0L of displacement, which is the largest in the industry, so it easily cranks out an estimated 158 hp. The 822 Pro Troll has the Q3 triple-tube setup with lifting strakes on both sides of all the tubes to help it plane quickly and ride high in the water. Its time to plane was a quick 2.4 seconds with practically no bowrise. The Mercury pulled strong and linear and pushed the Angler Qwest to 25 mph in 7.4 seconds and to a top speed of 37.2 mph. Max horsepower for the 822 (and the two-foot-longer 824) is 175 hp, which would put its top speed around 40 mph. Saginaw Bay, off Lake Huron, has a reputation for being rough thanks to an average depth of 15 feet and an area of 1,142 square miles, but we got lucky and had mostly two-footers for our day on the bay. At a cruise speed of around 25 mph, the 822 Pro Troll positively ate up the head seas. The Q3 tubes have really sharp nosecones for better slicing and oversized splash caps to keep the windshield from getting wet. The splash caps also provide additional insurance against stuffing the bow in large waves. The tubes are 23-inchers, which seems to concern some pontoon buyers, since the standard tube is 25 inches in diameter, but Qwest uses lightweight materials for items such as seat frames, so the boat’s dry weight is only 2,050 pounds, making 23-inch tubes more than sufficient to handle a payload of up to 1,900 pounds. Large lifting strakes kept the Pro Troll high in the water and when I trimmed the Mercury out a bit, the front half of the pontoons raised out of the water to provide more clearance over the waves. But the Pro Troll really shined when we got to the fishing grounds and started trolling. Unlike monohulls with deep-V hulls that can rock from side to side in similar conditions, the Qwest was incredibly stable, even when we trolled with its beam to the waves. This concept was a collaborative effort between Qwest’s owners, brothers Brad and Mark Dupuie, and Jeff Miller, the owner of Traxstech. It’s a hard-core fishing machine, but it has a playful side, with twin 60-inch couches up front that are covered in easy-to-clean Soft Touch vinyl. The laybacks face rearward, to accommodate the ultimate in lazy-angler rod-watching. One of the 822’s huge advantages over “regular” fishing boats is the comfort factor afforded by an enormous Bimini top that completely covers the area from the arch all the way to the bow. Michigan allows only three trolling rods per person, so we used six on test day, but Dupuie has had as many as 15 going at once. A boat that can have as many as 13 lucky anglers aboard had better be well laid out, and the 822 Pro Troll is the ultimate in ergonomic efficiency. Dupuie used the gunwale’s Traxstech tracks to affix cupholders and rod holders holding landing nets, ready for action. We caught a steady stream of keeper walleye that we measured on the stern work station, which included tool holders and a standard high-pressure hose for easy cleanups. 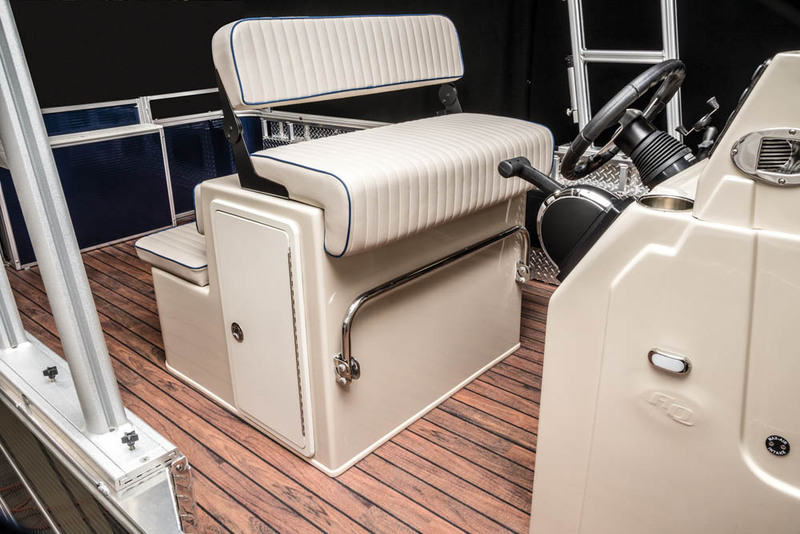 A nice touch are the twin flip-up jump seats at the transom, though they would have been more comfortable with backrests. There are plenty of other places to sit, including the small bench behind the console, which is perfect for line-watching and covers a 25-gallon livewell that Dupuie has used to hold up to 30 fish. Another similar seat in front of the console also has a livewell underneath, but we used it as a cooler. The 822 Pro Troll comes ready to fish and needs only a few options to fulfill its potential. 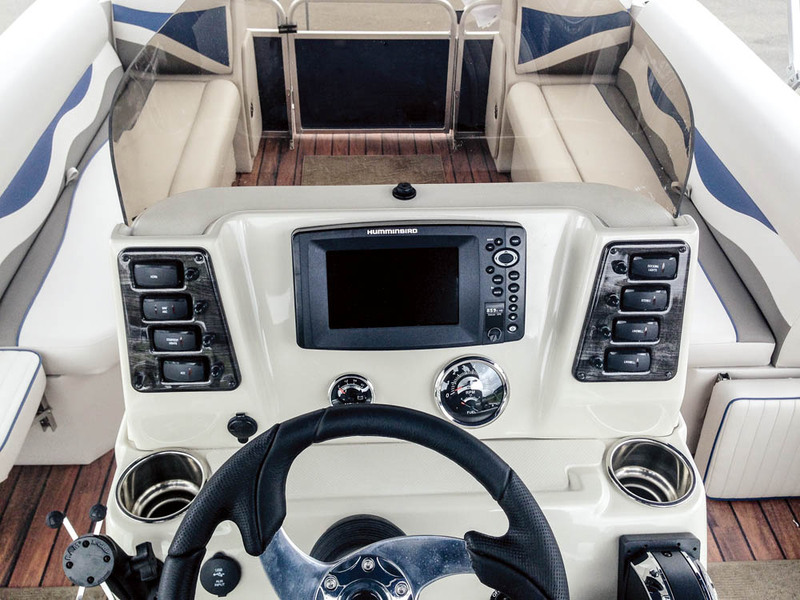 While the console is compact to preserve space, it is tall and has plenty of room for flush-mounted electronics such as the optional Humminbird 899 GPS/fishfinder. A tilt wheel, a handy universal cellphone holder and a Prospec stereo are standard, but our boat had the optional Infinity Bluetooth system. Underneath the leaning/sitting post is storage for Plano tackle boxes to starboard and three tackle drawers to port. Instead of the standard vinyl deck, our boat had the optional upscale teak vinyl floor that had excellent grip even when wet. Add a ski tow and you are ready for a change of pace when the fishing slows down. Purchased by Jason Priebe, plus Cooper, 15, and Brooks, 9, Unionville, Mich. Purchased at Linwood Beach Marina, Linwood, Mich. I wish I could get it with a bigger motor than a 150, for a faster top speed. I saw guys like Mike Avery and Mark Dupuie using the Angler Qwest Pro Troll in Saginaw Bay, where I do my boating, and it looked like the perfect rig. It gets really rough here, and for a pontoon it really handles rough conditions well. I’ve had up to nine very large men on this boat fishing, and it handled the load really well and gave everyone plenty of room. I love to fish for walleye, and the Pro Troll, with the arch and Traxtech system, allows me to run as many rods as I want when trolling. Parts of the lake are shallow, but my 822 doesn’t need much water to float. I love its versatility, which allows us to fish in the morning till we bag our limit and then go tubing or wakeboarding in the afternoon. I have the Minn Kota trolling motor with the iPilot system, so when I am jigging on structure I can use it as a virtual anchor. Linwood Beach Marina is an awesome place and they really take care of their customers, like the time ice started to block the entrance of the marina. They went out in several boats and cleared it to make sure we weren’t stranded. LOA: 23 ft., 2 in. I am a Bangladeshi out country have world largest sea beach but in our country haven’t any opportunity for this kink of work . Catch fish is also my favorite hobby . My is Dave from South Amherst,, Ohio. I have my own boat a 1976 24 foot Chris Craft Lancer and I do a lot of fishing on Lake Erie in the western / central basin. I also do a lot of trolling with down riggers. Can the 824 or 822 pontoon boats handle Lake Erie in rough water such as a 2-3 chop. I have been on you tube watching the videos with Anglers Qwest. I believe the guy’s name was Brad. I would like some more information about the pontoons and the type of fishing I do. Thanks Dave.